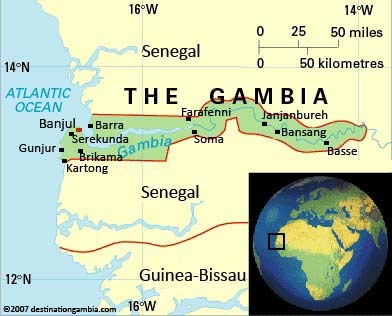 The Republic of The Gambia is one of the smallest and poorest country’s in Africa and lies about 13º north of the equator with a 50 mile Atlantic coastline. The country extends 300 miles into the African Continent, tracing the river Gambia, and is enveloped on 3 sides by Senegal. Like Ireland it has had a traumatic history with over 100,000 of its people being kidnapped and sent into slavery in the Caribbean during the 18th and 19th century. Many of these people and their descendants were “sold on” into the southern states of the USA. This cruel story was told in the 1970’s saga ‘Roots’ as we follow the life of Kunta Kinte into slavery. Gambia was colonized by Britain and finally gained its independence in 1965. The current political climate is stable and President Jammeh was re-elected just recently with a 72% majority vote. 95% of the 1.5 million population is Muslim and while English is the official language, and the language of school instruction, tribal languages such as Mandinka, Wolof, Fula and Jola are widely used in the homes and in general conversation between Gambians. The Gambia is primarily an agricultural country with ground-nuts accounting for 85% of exports. The fledgling tourism industry is also a huge contributor to the economy and accounts for up to 60% of GDP. The rapidly expanding population is stretching educational resources and schools are struggling to cope with pupil numbers. It is not unusual for classes to have as many as 50 pupils. Illiteracy rates are high as reflected in the low ‘Human Development Index Scores’. These rankings are based on Education, Access to Health Services and Women’s Access to Social Services. Per Capita income is amongst the lowest in the world. However its people are peace loving, friendly and all who come here get a great ‘Céad Mile Fáilte’ as we did. No wonder it’s called the ‘Smiling Coast of Africa’. If you wish to participate in any of the volunteering areas or indeed if you have any suggestions on any other area please complete the Contact us form or phone us.